I am a fair skinned girl, and I do not tan easily. I have come to accept, and appreciate that fact and have learned to preserve my skin and keep it youthful looking for as long as possible. However, in the summer, I do like it better with a tan (don't we all, at least in the Western world). I am also a little lazy when it comes to beauty treatments - and cheap, let's be honest, I'd rather spend my money on an actual trip to Hawaii than on my appearance to make it look like I just came back from a trip to Hawaii. 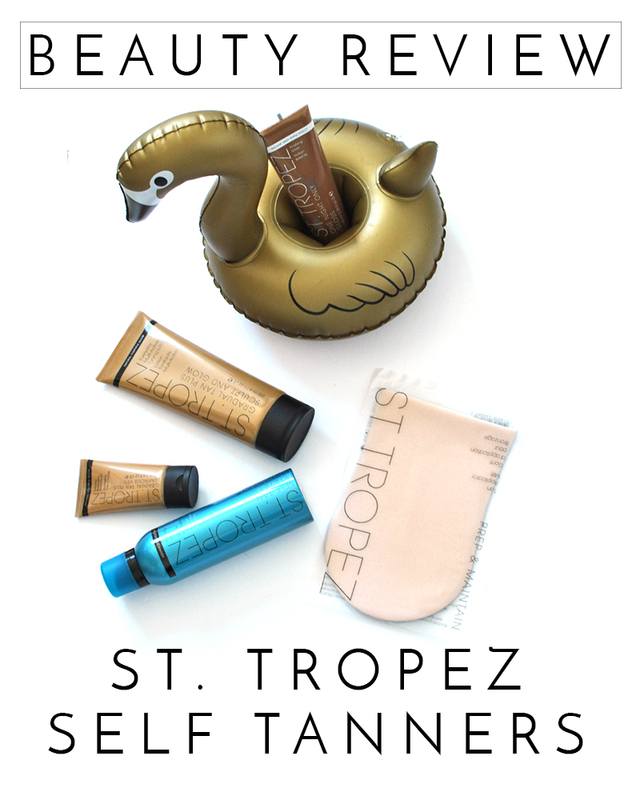 Well, after years and years of hearing wonderful things about St. Tropez self tanning products, I finally got to try them. I tested the Luminous Face Veil, the Tan Sculpt and Glow, the Self Tan Express Advanced Bronzing Mousse, and the One Night Only Finishing Gloss. These are all fairly new and I can tell you right now, I enjoyed them all except for one, and I'll explain why. Also keep in mind that aside from a plethora of drugstore gradual tanning lotions, I am a self-tanner newbie and probably have a lot to learn. I was a little afraid to try this at first, picturing dark orange eyebrows or brown patchy spots on my face, but I finally gave it a few tries and I can say with confidence that 1) it looks incredibly natural 2) it it easy to apply and impossible to mess up 3) it did not break me out. It's a great way to add a little color to your face, or if you want to color match your self-tanned body, etc. I love using this to create a deeper "base" tan that I then maintain with gradual lotions or quicker-to-use sprays (the Bioderma Photoderm is my favorite). Again, I was scared at first and discovered it is very easy to apply, the mitt makes blending completely effortless and it lasts well. It is worth mentioning that it does not have that terrible wet-dog self tanner smell, nor did it stain my white sheets (two of my main concerns when it comes to self-tanner). The one issue I have with this is: who has the time to apply self-tanner and let it develop for 3 hours (while not wearing clothes) before they can shower? WHO? I love this. I use it every 2-3 days to maintain my tan and it's the best gradual tanning lotion I've ever used (and I've used many). It is smooth, easy to apply and blend, doesn't ball up when you rub it in, and I love that it has firming properties. Yes, it does make me smell like a wet-dog, but the smell is definitely not as strong as it is in some of the other brands. It doesn't stain my bedsheets or bath towel and doesn't rub off on my clothes, either. I'll just come out and say it: I don't love this. But it's one of those "it's not you it's me" situations. I have tried leg/body makeup before and while it makes my legs look incredible, I can't stand the feeling of it (and the feeling that I will stain everything I touch). 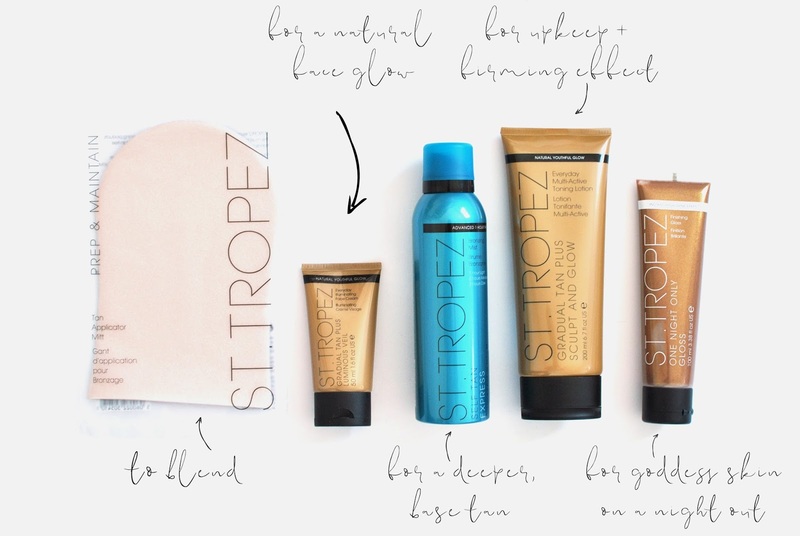 This product will make your skin look divine - IF you already have a tan. Otherwise, it looks a bit spotty. It is a rather sticky product that you definitely "feel" on your skin. It is also, like most body makeup, a pain to rub off in the shower. Unless I decided to become a professional bodybuilder, I probably wouldn't use this on a regular basis. Do you self tan? What do you use? These products were sent to me for free for review purposes. Opinions are my own.